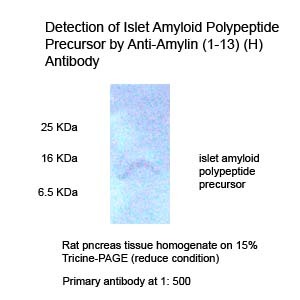 Human islet amyloid polypeptide (IAPP) (Amylin). The amyloidogenic region of IAPP is responsible for providing a toxic conformational structure within islets. Note disulfide bond at position C2 and C7. Hayden et al. JOP. 2005 Jul 8;6(4):287-302. Amino acid sequences of human amylin and the synthetic amylin analog pramlintide. Acute hormonal response to glucose, lipids and arginine infusion in overweight cats. In cats, the incidence of obesity and diabetes is increasing, and little is known about specific aspects of the endocrine control of food intake in this species. Recent data suggest that ghrelin has an important role in the control of insulin secretion and vice versa, but this role has never been demonstrated in cats. Here we aimed to improve our understanding about the relationship between insulin, amylin and ghrelin secretion in responseto a nutrient load in overweight cats. After a 16 h fast, weekly, six overweight male cats underwent randomly one of the four testing sessions: saline, glucose, arginine and TAG. All solutions were isoenergetic and isovolumic, and were injected intravenously as a bolus. Glucose, insulin, acylated ghrelin (AG), amylin and prolactin were assayed in plasma before and 10, 20, 40, 60, 80 and 100 min after the nutrient load. A linear mixed-effects model was used to assess the effect of bolus and time on the parameters. A parenteral bolus of glucose or arginine increased insulin and ghrelin concentrations in cats. Except for with the TAG bolus, no suppression of ghrelin was observed. The absence of AG suppression after the intravenous load of arginine and glucose may suggest: (1) that some nutrients do not promote satiation in overweight cats; or that (2) AG may be involved in non-homeostatic consumption mechanisms. However, the role of ghrelin in food reward remains to be assessed in cats. The authours of this paper used Phoenix’s Amylin RIA kit (RK-017-03) for their the amylin level study in cats. Martin LJ1, Lutz TA2, Daumas C et al., J Nutr Sci. 2014 Apr 30;3:e8. doi: 10.1017/jns.2014.4. eCollection 2014. Diet-induced obesity is a lifestyle-associated medical condition that increases the risk of developing cardiovascular disease, type 2 diabetes and certain types of cancer. Here we report the design of a closed-loop genetic circuit that constantly monitors blood fatty acid levels in the setting of diet-associated hyperlipidemia and coordinates reversible and adjustable expression of the clinically licensed appetite-suppressing peptide hormone pramlintide. Grafting of the peroxisome proliferator-activated receptor-α onto the phloretin-responsive repressor TtgR produces a synthetic intracellular lipid-sensing receptor (LSR) that reversibly induces chimeric TtgR-specific promoters in a fatty acid-adjustable manner. Mice with diet-induced obesity in which microencapsulated cells engineered for LSR-driven expression of pramlintide are implanted show significant reduction in food consumption, blood lipid levels and body weight when put on a high-fat diet. Therapeutic designer circuits that monitor levels of pathologic metabolites and link these with the tailored expression of protein pharmaceuticals may provide new opportunities for the treatment of metabolic disorders. The authors of this paper used Phoenix’s Amylin EIA kit (EK-017-11) for their study . Rössger K, Charpin-El-Hamri G, Fussenegger M, Nat Commun. 2013;4:2825. doi: 10.1038/ncomms3825. Reduced amylin levels are associated with low bone mineral density in women with anorexia nervosa. CONTEXT: Anorexia nervosa, characterized by extreme low body weight due to reduced nutrient intake, is associated with severe bone loss. Peptide hormones, including amylin, GIP, and GLP2, are released immediately after nutrient intake and may be involved in the regulation of boneturnover. OBJECTIVE: To investigate fasting levels of amylin, GIP, and GLP2 and their relationships with bone mineral density (BMD) in women with anorexia nervosa compared to healthy controls. STUDY PARTICIPANTS: 15 women with anorexia nervosa and 16 healthy controls. MAIN OUTCOME MEASURES: Fasting serum amylin, GIP, and GLP2, and BMD. RESULTS: Women with anorexia nervosa had significantly lower fasting serum amylin and GIP levels than healthy controls. Fasting serum GLP2 levels were not significantly different between groups. Fasting amylin levels were positively associated with BMD and Z-score at the PA spine, total hip, and femoral neck. Fasting amylin levels were also positively associated with weight and percent fat; after controlling for these variables, amylin was still a significant predictor of BMD and Z-score at the femoral neck and of Z-score at the total hip. In the anorexia nervosa group, there was a trend toward an inverse association between amylin and C-terminal telopeptide (CTX) levels (R=-0.47, p=0.08). GIP and GLP2 levels did not predict BMD at any site. CONCLUSION: Decreased secretion of amylin may be a mechanism through which reduced nutrient intake adversely affects BMD in anorexia nervosa. Wojcik MH, Meenaghan E, Lawson EA et al., Bone. 2010 Mar;46(3):796-800. doi: 10.1016/j.bone.2009.11.014. Epub 2009 Nov 18. Postprandial hyperglycemia and preprandial hypoglycemia contribute to poor glycemic control in type 1 diabetes. We hypothesized that postprandial glycemic excursions could be normalized in type 1 diabetes by suppressing glucagon with pramlintide acetate in the immediate postprandial period and supplementing glucagon in the late postprandial period. A total of 11 control subjects were compared with 8 type 1 diabetic subjects on insulin pump therapy, using the usual insulin bolus-to-carbohydrate ratio during a standard liquid meal. Type 1 diabetic subjects were then randomized to two open-labeled studies. On one occasion, type 1 diabetic subjects received a 60% increase in the insulin bolus-to-carbohydrate ratio with minidose glucagon rescue injections, and on the other occasion type 1 diabetic subjects received 30-45 microg pramlintide with their usual insulin bolus-to-carbohydrate ratio. Glucose, glucagon, amylin (pramlintide), and insulin concentrations were measured for 420 min. 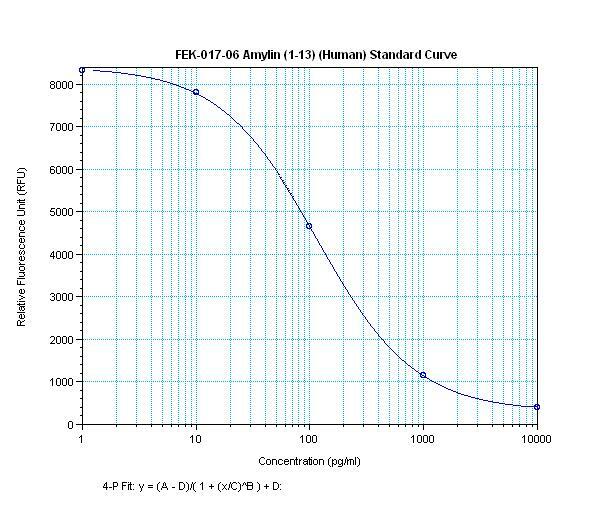 The plasma glucose area under the curve (AUC) for 0-420 min was lower in control versus type 1 diabetic subjects (316 +/- 5 vs. 929 +/- 18 mg x h(-1) x dl(-1), P < 0.0001). Pramlintide, but not an increase in insulin, reduced immediate postprandial hyperglycemia (AUC(0-180 min) 470 +/- 43 vs. 434 +/- 48 mg x h(-1) x dl(-1), P < 0.01). Pramlintide administration suppressed glucagon (P < 0.02), and glucagon injections prevented late hypoglycemia with increased insulin. In summary, in type 1 diabetes, glucagon modulation with pramlintide as an adjunct to insulin therapy may prove beneficial in controlling postmeal glycemic swings. Heptulla et al. Diabetes. 2005 Apr;54(4):1100-7. BACKGROUND: Amylin is a novel 37 amino acid peptide hormone that is co-secreted with insulin from the pancreas in response to food intake. As a potent inhibitor of gastric emptying it plays an important role in the control of carbohydrate absorption. Feed intolerance is common in infants of diabetic mothers (IDM). AIMS: To establish a normal range of amylin levels in healthy neonates, and to determine whether serum amylin levels are raised in IDM. METHODS: A serial sample of 221 infants > or =28 weeks gestation was enrolled prior to delivery over a 12 month period. Blood samples collected immediately after birth (umbilical cord), and at the routine Guthrie test were analysed for amylin and insulin levels. RESULTS: Amylin levels in umbilical cord (n = 181) and Guthrie samples (n = 33) of healthy infants were 5.7 (3.0-9.1) and 6.9 (2.9-9.0) pmol/l respectively. IDM had significantly raised amylin levels in both cord (n = 31; 32.7 pmol/l, 25.9-48.1) and Guthrie samples (n = 8; 18.1 pmol/l, 15.3-23.6). 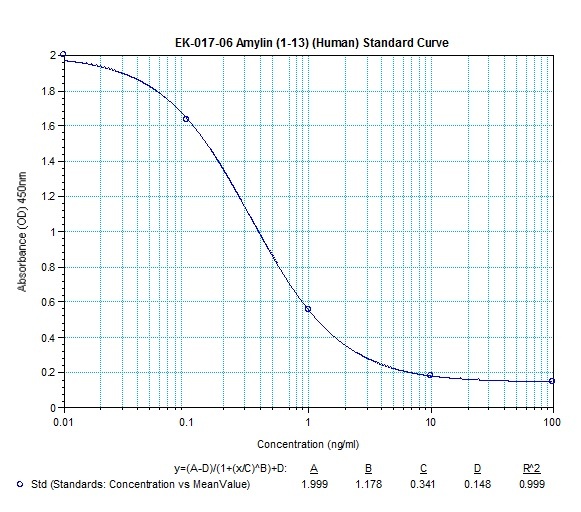 Amylin correlated positively with insulin (n = 42; r = 0.67; 95% CI 0.4 to 0.81), birth weight (r = 0.22; 95% CI 0.08 to 0.36), and gestation (r = 0.18; 95% CI 0.03 to 0.32). Umbilical cord venous amylin levels showed agreement with arterial cord amylin levels (n = 34, mean bias -0.2, 95% CI 3.1 to -3.6). CONCLUSIONS: Amylin levels are significantly increased in the umbilical cord and Guthrie blood samples in IDM. Kairamkonda et al. Arch Dis Child. 2005 Dec;90(12):1279-82. Epub 2005 Sep 20. The causes of cerebral accumulation of amyloid ß-protein (Aß) in most cases of Alzheimer’s disease (AD) remain unknown. We recently found that homozygous deletion of the insulin-degrading enzyme (IDE) gene in mice results in an early and marked elevation of cerebral Aß. Both genetic linkage and allelic association in the IDE region of chromosome 10 have been reported in families with late-onset AD. For IDE to remain a valid candidate gene for late-onset AD on functional grounds, it must be shown that partial loss of function of IDE can still alter Aß degradation, but without causing early, severe elevation of brain Aß. Here, we show that naturally occurring IDE missense mutations in a well-characterized rat model of type 2 diabetes mellitus (DM2) result in decreased catalytic efficiency and a significant 15 to 30% deficit in the degradation of both insulin and Aß. Endogenously secreted Aß40 and Aß42 are significantly elevated in primary neuronal cultures from animals with the IDE mutations, but there is no increase in steady-state levels of rodent Aß in the brain up to age 14 months. We conclude that naturally occurring, partial loss-of-function mutations in IDE sufficient to cause DM2 also impair neuronal regulation of Aß levels, but the brain can apparently compensate for the partial deficit during the life span of the rat. Our findings have relevance for the emerging genetic evidence suggesting that IDE may be a late-onset AD-risk gene, and for the epidemiological relationships among hyperinsulinemia, DM2, and AD. Farris et al. Am J Pathol. 2004 Apr;164(4):1425-34. Amylin agonists: a novel approach in the treatment of diabetes. Amylin is a peptide hormone that is cosecreted with insulin from the pancreatic beta-cell and is thus deficient in diabetic people. It inhibits glucagon secretion, delays gastric emptying, and acts as a satiety agent. Amylin replacement could therefore possibly improve glycemic control in some people with diabetes. However, human amylin exhibits physicochemical properties predisposing the peptide hormone to aggregate and form amyloid fibers, which may play a part in beta-cell destruction in type 2 diabetes. This obviously makes it unsuitable for pharmacological use. A stable analog, pramlintide, which has actions and pharmacokinetic and pharmacodynamic properties similar to the native peptide, has been developed. The efficacy and safety of pramlintide administration has been tested in a vast number of clinical trials. Approximately 5,000 insulin-treated patients have received pramlintide and approximately 250 for > or =2 years. 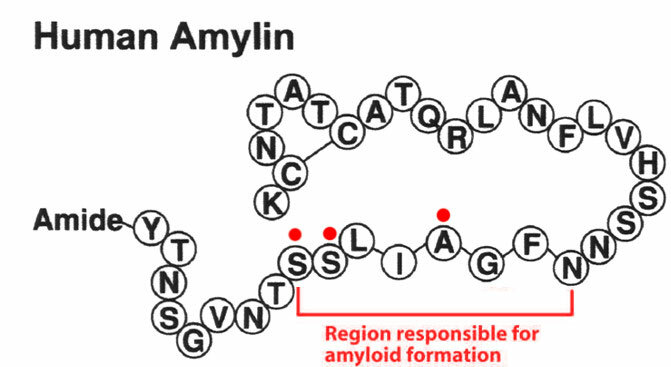 The aims of this review are to 1) briefly describe actions of amylin as demonstrated in animal and human models and 2) primarily review results from clinical trials with the amylin analog pramlintide. Schmitz et al. Diabetes. 2004 Dec;53 Suppl 3:S233-8. Islet amyloid: a critical entity in the pathogenesis of type 2 diabetes. 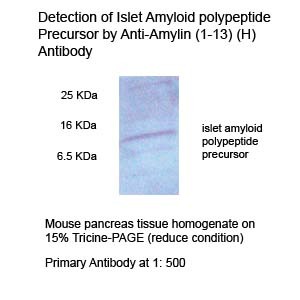 Islet amyloid deposition is a pathogenic feature of type 2 diabetes, and these deposits contain the unique amyloidogenic peptide islet amyloid polypeptide. Autopsy studies in humans have demonstrated that islet amyloid is associated with loss of beta-cell mass, but a direct role for amyloid in the pathogenesis of type 2 diabetes cannot be inferred from such studies. Animal studies in both spontaneous and transgenic models of islet amyloid formation have shown that amyloid forms in islets before fasting hyperglycemia and therefore does not arise merely as a result of the diabetic state. Furthermore, the extent of amyloid deposition is associated with both loss of beta-cell mass and impairment in insulin secretion and glucose metabolism, suggesting a causative role for islet amyloid in the islet lesion of type 2 diabetes. These animal studies have also shown that beta-cell dysfunction seems to be an important prerequisite for islet amyloid formation, with increased secretory demand from obesity and/or insulin resistance acting to further increase islet amyloid deposition. Recent in vitro studies suggest that the cytotoxic species responsible for islet amyloid-induced beta-cell death are formed during the very early stages of islet amyloid formation, when islet amyloid polypeptide aggregation commences. Interventions to prevent islet amyloid formation are emerging, with peptide and small molecule inhibitors being developed. These agents could thus lead to a preservation of beta-cell mass and amelioration of the islet lesion in type 2 diabetes. Hull et al. J Clin Endocrinol Metab. 2004 Aug;89(8):3629-43. Many insulin-treated diabetic patients still fail to achieve optimal glycemic control and continue to experience problems with hypoglycemia, weight gain, and postprandial hyperglycemia. Adjunctive therapy with pramlintide, a synthetic analog of the human amylin hormone, facilitates a significant improvement of postprandial and overall glycemic control in patients with either type 1 or type 2 diabetes without an increased risk of hypoglycemia or weight gain. Islet amyloid polypeptide (IAPP) misfolding leads to protein aggregates. This image depicts the endoplasmic reticulum (ER), Golgi apparatus, and the lysosome-proteasome complex in relation to the unfolding and misfolding of IAPP. IAPP is transcribed from chromosome 12 (1). Translation of IAPP gene occurs (2). In the absence of significant ER stress, chaperones are able to properly fold IAPP. Post-translational modifications of IAPP include the formation of a disulfide bond at positions C2 and C7, as well as amide formation at the C-terminal tyrosine. The vulnerability of the disulfide bond may play an important role in the unfolding of IAPP (3a) or in the presence of significant ER stress, IAPP may become unfolded and misfolded (3b). IAPP oligomers may form. 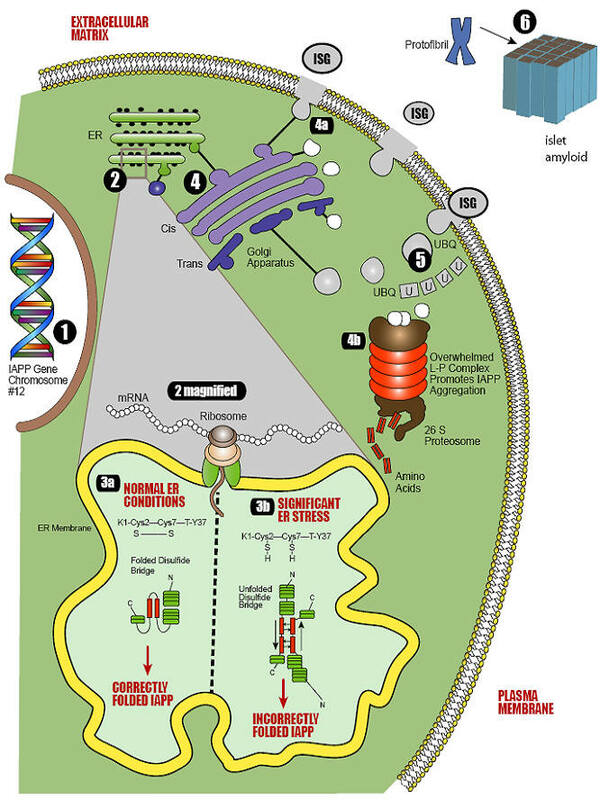 IAPP is transported to the Golgi apparatus (4). Normal processing in the absence of significant ER stress results in cosecretion of normal insulin and IAPP in insulin secretory granules (4a). Once unfolded and misfolded, aberrant IAPP is processed initially in the Golgi apparatus, and there is an additional attempt to refold the misfolded protein. If this is unsuccessful, the misfolded protein then goes to the lysosome-proteasome complex for degradation to its constituent amino acids (4b). Ubiquitination pathways are also employed to facilitate trafficking to the lysosome-proteasome complex (5). When these organelles are overwhelmed, as occurs in early T2DM before beta cell failure, the result will be apoptosis of the beta cell and the accumulation and aggregation of protofibrils into beta-pleated sheets. Subsequently, islet amyloid is formed (6). Schematic representation of study design. BS, blood sugar; carb, carbohydrates; S/C, subcutaneous. Proposed model of amylin and insulin action in postprandial glucose homeostasis. Insulin is the major hormonal regulator of glucose disposal. Preclinical and clinical studies indicate that amylin complements the effects of insulin by regulating the rate of glucose inflow to the bloodstream.